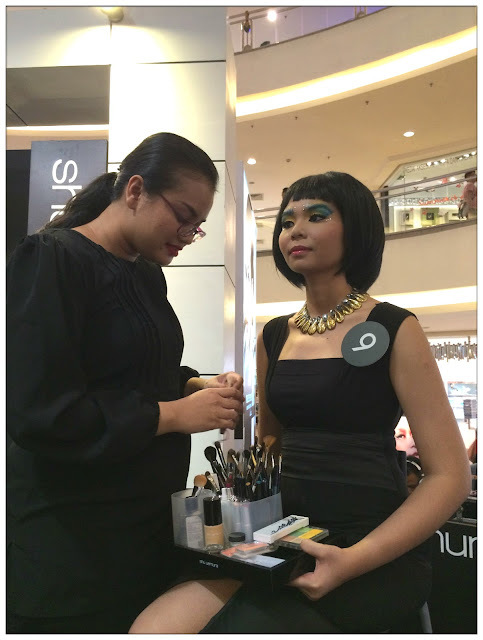 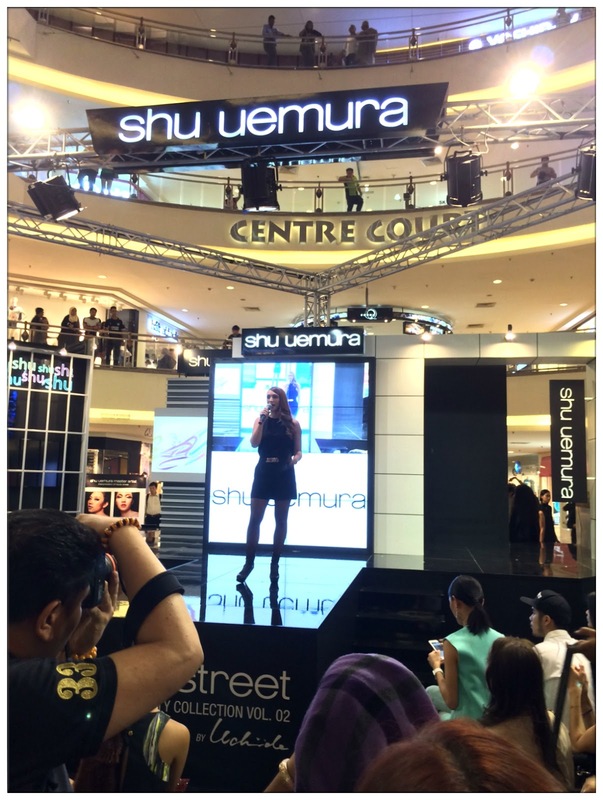 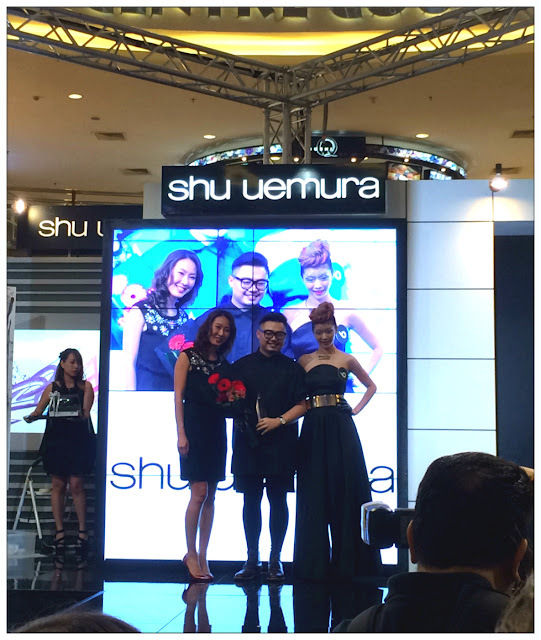 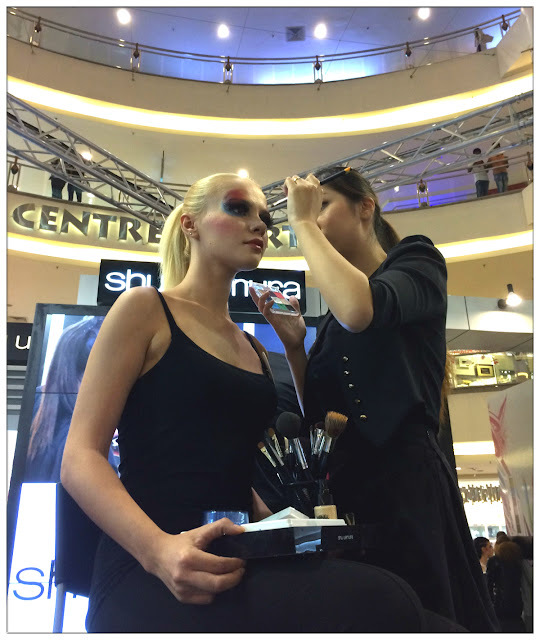 And the final of Shu Uemura's Make Up Competition 2015! 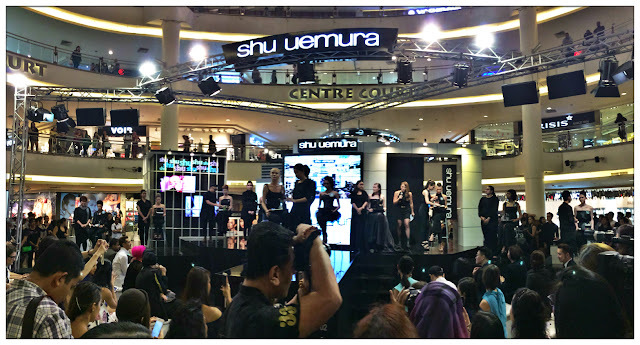 It was an eye-opening international level event as I get to see all the Shu Uemura's Malaysia master artists works, the uprising make-up artist that compete, and also the works of Shu Uemura's International Artistic Director - Kakuyasu Uchiide-san perform his make-up skill on stage alongside with street art performance by Ōyama Enrico Isamu-san, which flew in from New York to Malaysia. The grand final stage for Shu Uemura's Make Up Competition 2015.
Who will be the one that walk away with Shu Uemura's grand prize? 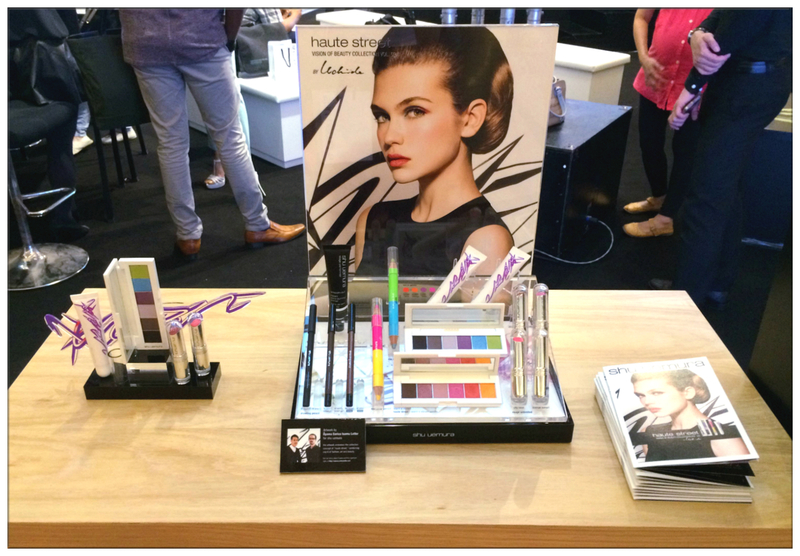 Even lashes can be "Haute Street"! 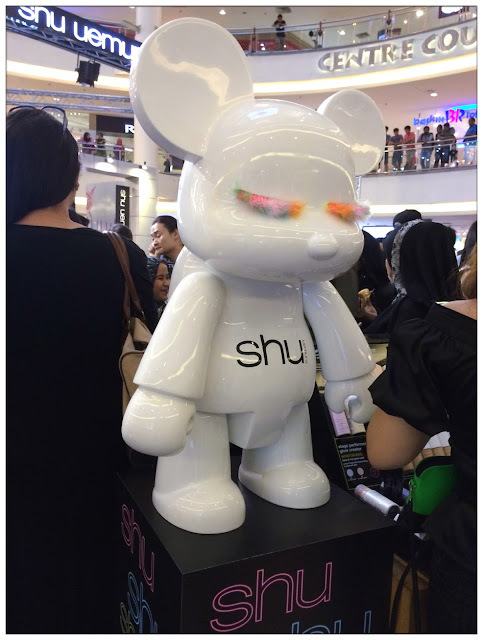 Haute Street - "awaken creativity to reveal undiscovered beauty" as quoted from Uchiide-san, it is a new combination of street art creativity and make-up which make people feeling inspired. 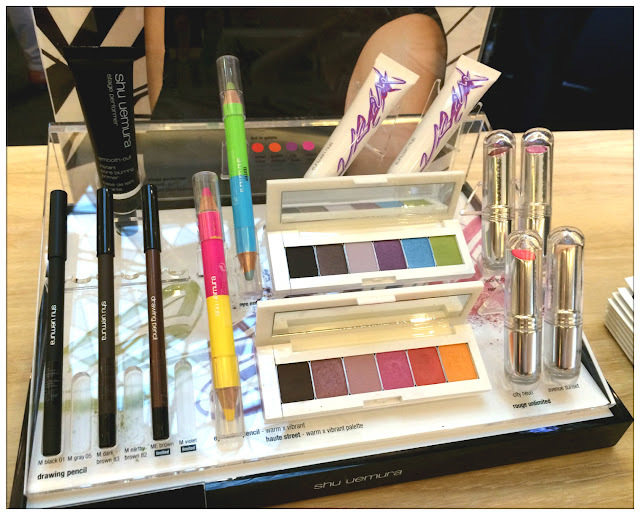 The unique and vibrant colours colour expressing make-up looks are what Shu Uemura is trying to convey to everyone this season, hence the release of Vision of Beauty Collection Vol.02, which is the collaboration between Uchiide-san and Oyama-san, which brought Shu Uemura's expressing in make-up to another new level. 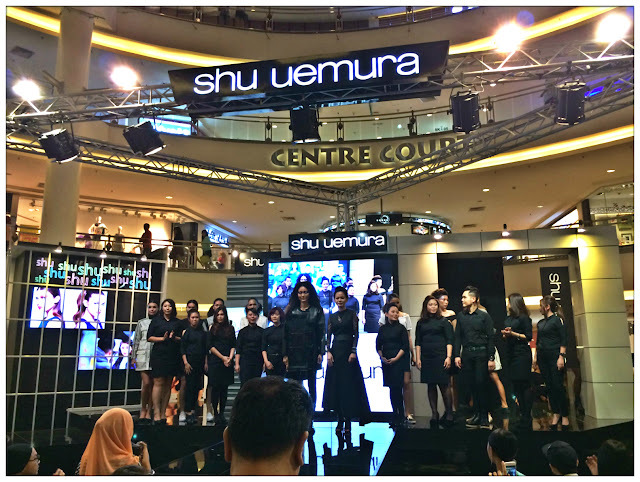 Right after, we were presented with 10 looks prepared by Malaysia's Shu Uemura master artists team, led by Lisa Yap, the education manager and Shu atelier artist, which happens to be one of the six elite make-up artist of Shu Uemura International. 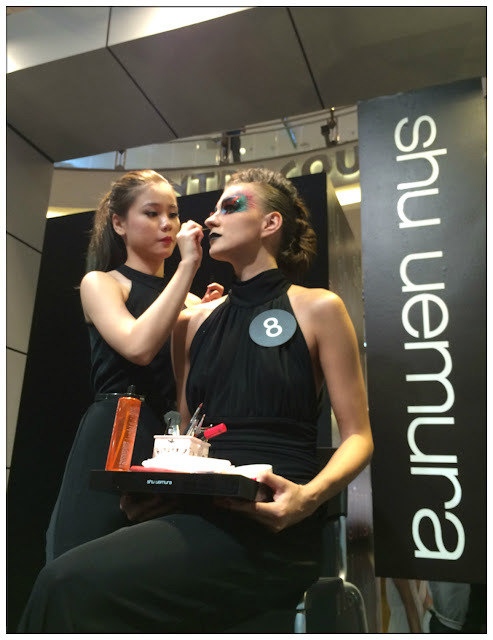 The team showed us their interpretation of Haute Street, creating the Shu style's cutting-edge make-up using bold colours for bold expressions. Guests are wowed by all their boundless creativity and the sense of individuality and style of each master artist. 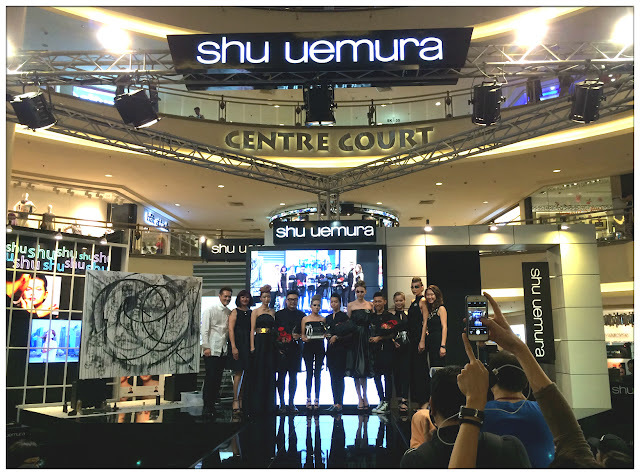 Lisa Yap (education manager & Shu Atelier Artist), Brenda Yap, Samantha Lee, Anges Ng, May Koh, Christy Wong, Fiona Tan, CK Lee, Zenna Au, Christine Tan and Celine Toh. 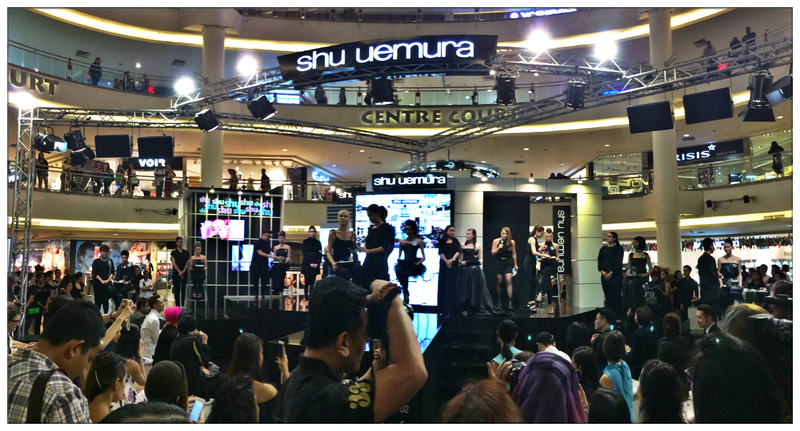 Next, is the grand final of Shu Uemura's Make-up Competition 2015 which has been the hype topic among make-up artists around me since May! Finally get to see the Top 10 finalists and they are gonna perform their awesome make-up skill on the stage to complete their final looks in just 20 minutes time. 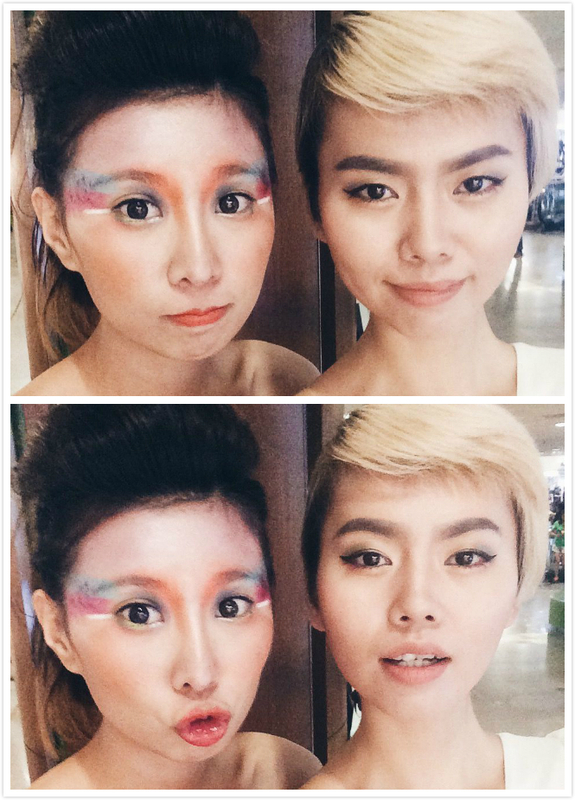 Here are some close-ups of the top 10 finalists, doing their own interpretation of "Haute Street", the freedom of expressing make-up with bold colours. 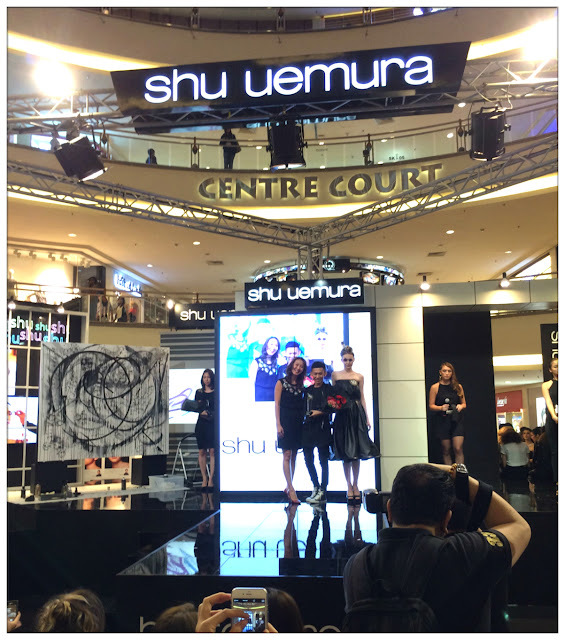 These make-up artists presented their amazing skills to the judges and guests that night, showing their capability and their own definition of "Haute Street" of Shu Uemura in different colours, different techniques and unique tools such as lashes. 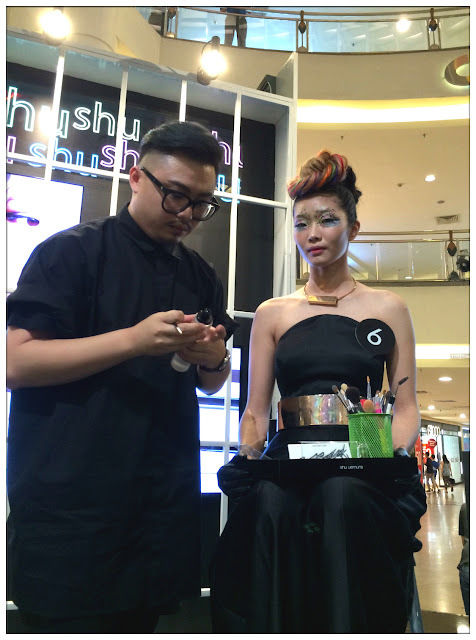 It also shows that by expressing yourself through make-up, you don't have to follow the rules one-by-one, just create your own rules in expressing your mood and looks, you can be a street artist using your face as canvas too! 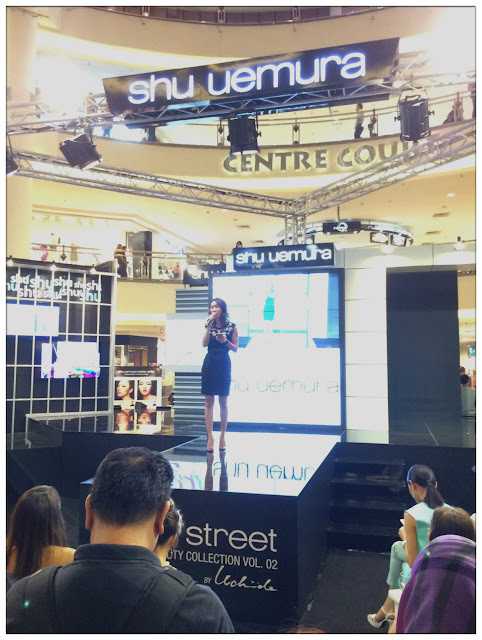 To all of us, it was tensed 20 minutes because we all wanted to see the final looks of these top 10 finalists eagerly, and wondering who will be the one that walk away with all the prizes. 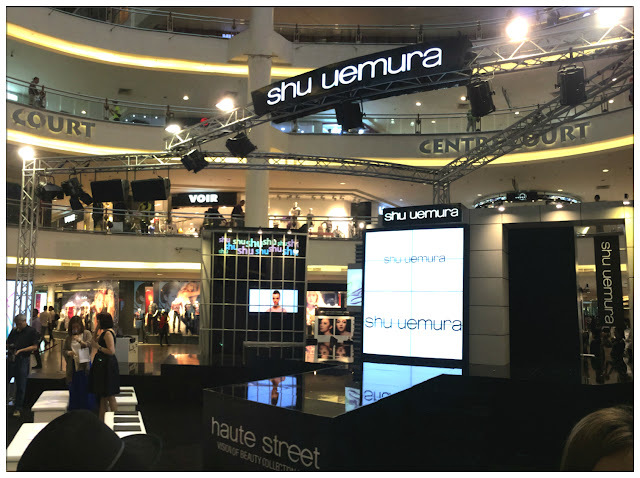 So while waiting for the judges to finish marking the scores and also for the crews to calculate the final score, we were treated to a electrifying visual performance by both Ōyama-san and Uchiide-san. 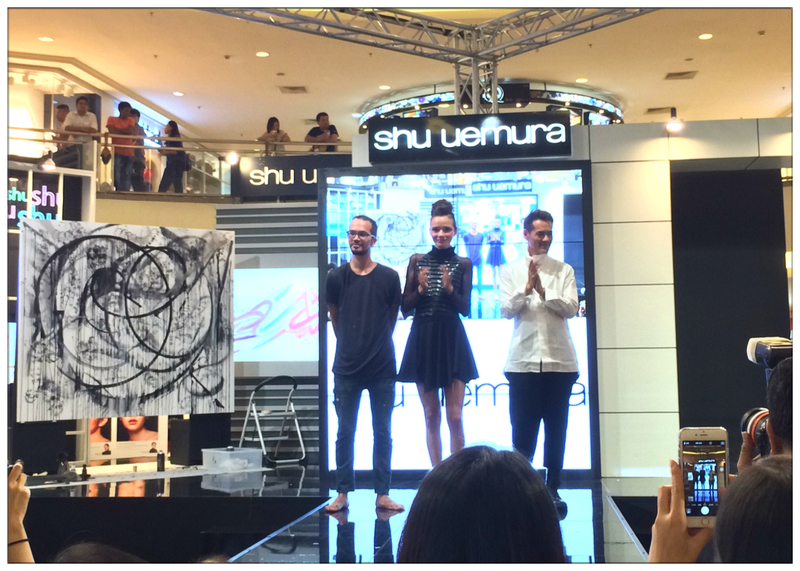 How often can you see a live performance from a street artist from New York? Ōyama-san is based in New York city, and has then express his love of street art since mid 2000's. 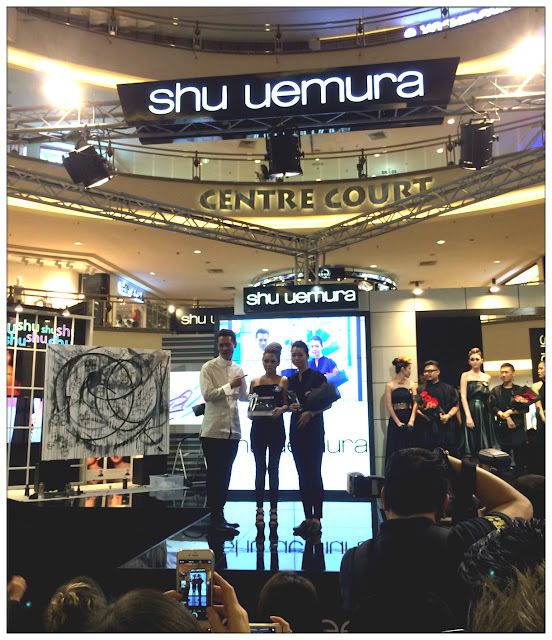 His signature art expression called "Quick Turn Structure" - black and white angular and yet spontaneous motif which earned him a place in the scene of street art internationally. 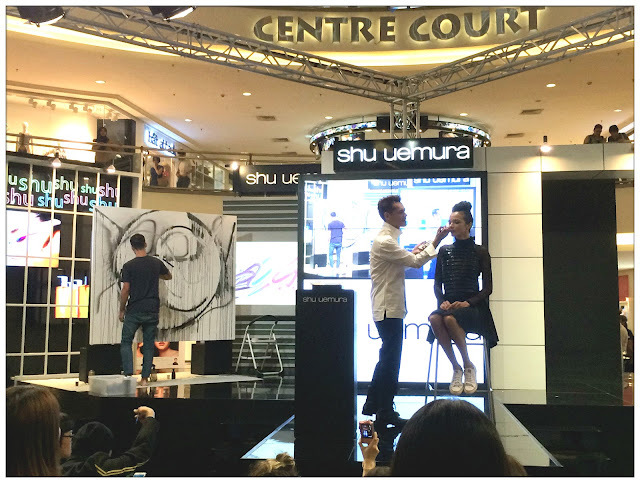 His simplicity, cool, urban and yet stunning art skills collaborated with Uchiide-san's bold colour skillful make-up expression has presented to us guests a multi-form of street art and beauty combined. 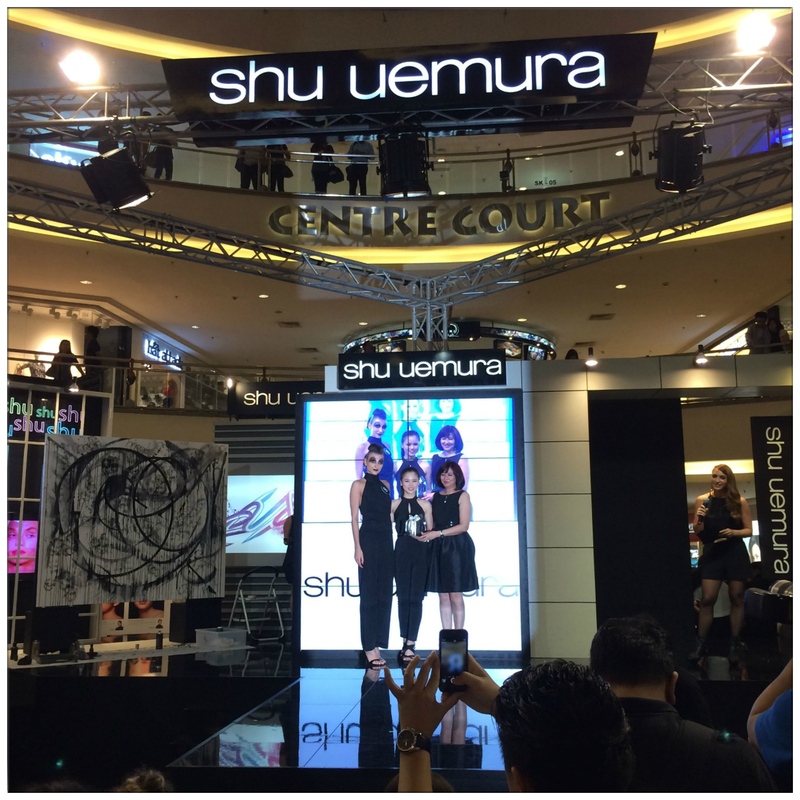 Immediately after the awesome performance by two international artists, here comes the moment we all been waiting for: the Top 3 winners of Shu Uemura Make-up Competition 2015 and also the people's choice award. and the winner is Cheong Hui Kuan! She'll be going to Tokyo for a 3 days 2 nights trip with RM1000 travel allowance and also invited to an exclusive Shu Uemura event in Tokyo, an artistic edition brush set worth RM1300, trophy and cert. 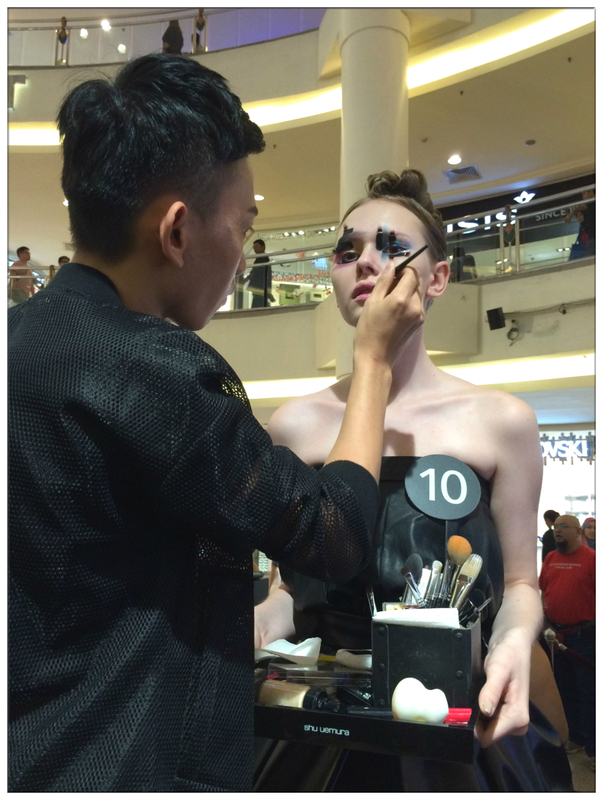 To view all the Top 10 finalists looks that they presented up-close: Click Here! 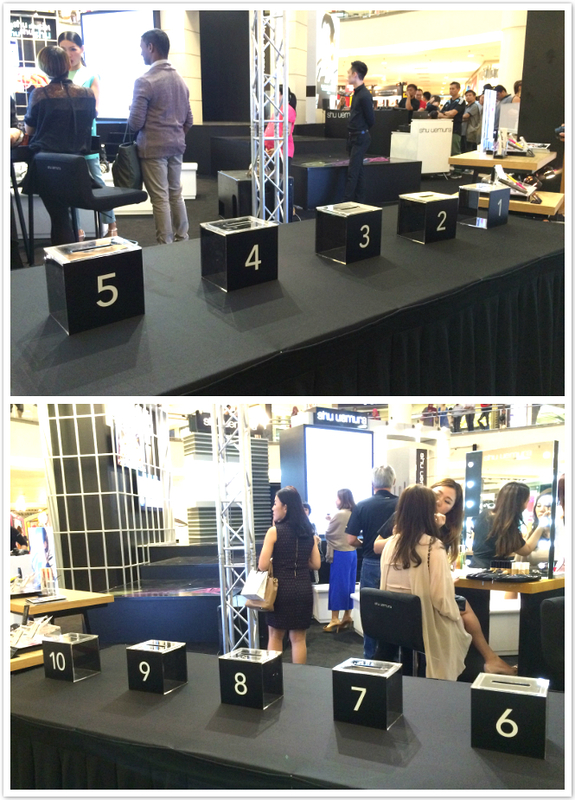 Once again congrats to all the winners and also to the rest that made it all the way to top 10! 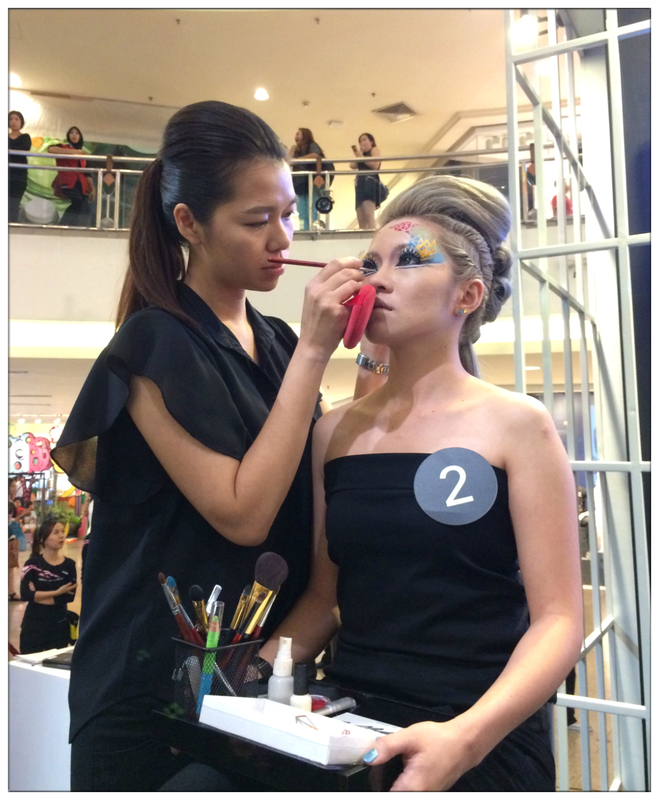 It was an awesome performance by all these make-up artists that shows their passion and enthusiasm in expressing how they feel using make-up. 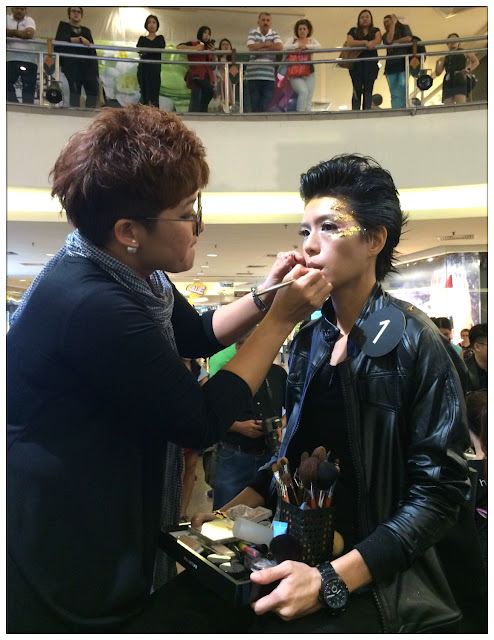 I guess I shall be bolder too in expressing make-up too! 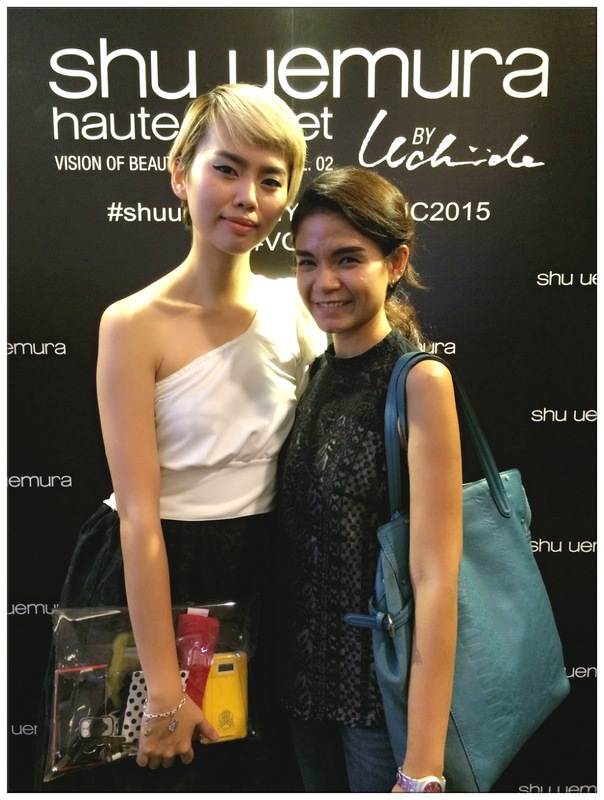 With Kate Chan, one of the model that presented the looks by master artist. 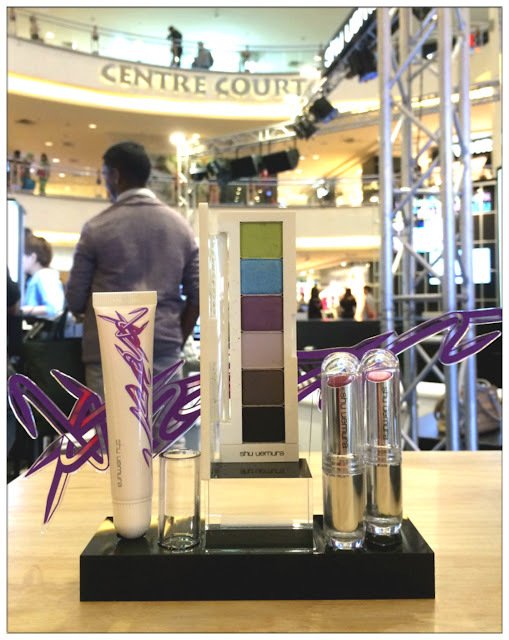 Look at them vibrant colours! My favourite will be the Haute Street Palette Cool x Chic version which is a limited edition! This collection has the collaborative artwork created by both Uchiide-san and Ōyama-san. 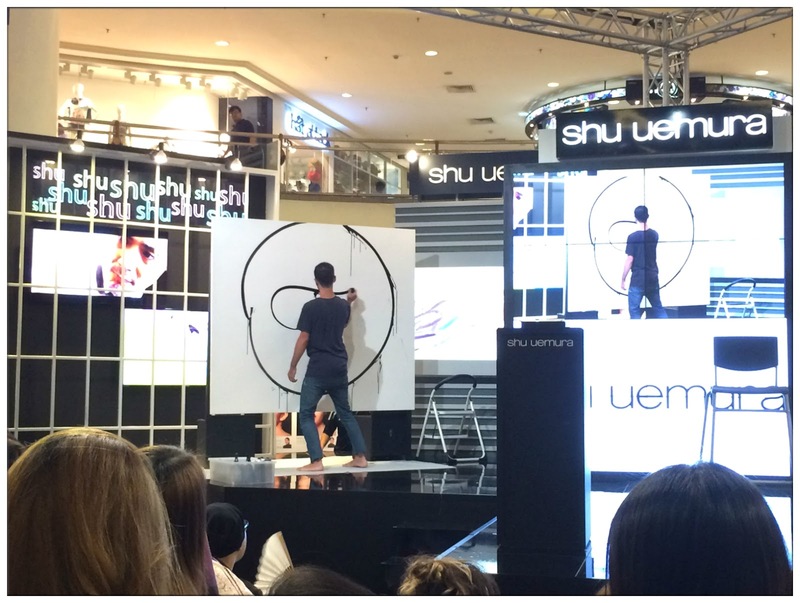 There are letters of "S""H""U" hidden in the signature Quick Turn Structure artwork. 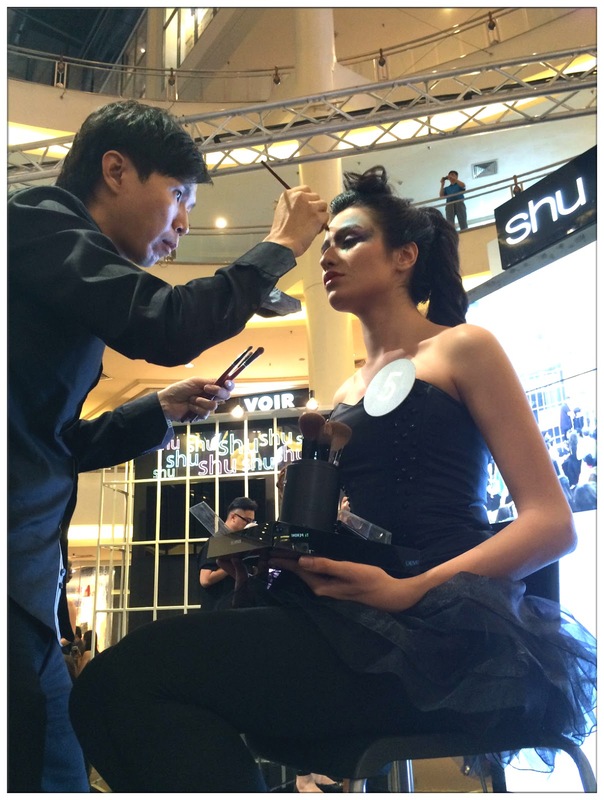 It was a night filled with creativity and colours by Shu Uemura. I'm so thankful I was there to witness the birth of Shu Uemura Make-Up Competition 2015 Grand Prize winner and also, performance by both international artists from different industry. Definitely looking forward to the next Shu Uemura Make-Up Competition and also their upcoming collection.